Even though this is one unit, there is garbage and discarded junk lining the ENTIRE block. It was there yesterday. It remains there today. It's that way almost EVERY day. Sometimes there is garbage set out 15 minutes after the sanitation trucks run. There is always a surfeit of junk and discards on the curbs on the weekends. Please consider a multi-pronged education and enforcement effort for this street. If it isn't done, the 101st and Elm area will never draw new, quality tenants. Thank you for reporting. This issue has been assigned to staff member to investigate. Please check back for updates. White dog consistently off leash and able to roam free. Small dog but it has chased pedestrians on multiple occasions. Unsure who owns it and how often it is left to roam. 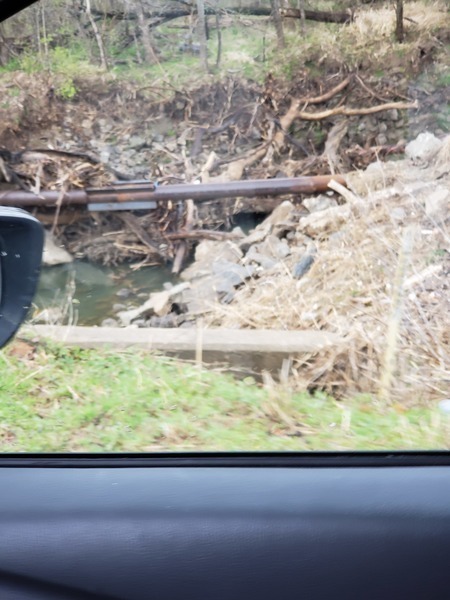 the gas line or whatever pipe that was recently replaced that goes over the creek has large logs pushing on it whenever we get a lot of rain. almost looks like a giant beaver dam. Thanks for reporting! This issue has been resolved. If you have further questions, you can reopen this issue or create a new one. Thanks again for contacting the Action Center - Broken Arrow. Street must be re-stripped. It is impossible to see the lines at night. Come on BA!!! Has needed to be redone for years. Thanks for reporting! This street has been added to the list of Streets that will be re-stripped in the near future. If you have further questions, you can reopen this issue or create a new one. Thanks again for contacting the Action Center - Broken Arrow. There are multiple potholes mainly in the eastbound lane between Evans and Oneta on Houston (81st). The road is asphalt and is really in desperate need of a resurface project. In front of a fire hydrant, on the other side of the sidewalk, is a small round cement "plug" that says "water". This has receeded into the ground along with the dirt. The neighbors to our west has a larger "plug" that is doing the same thing & a few others along that side of Reno to the west. I am concerned with the safety of firefighters and children, as well as the as asthetic value. Does something need to be repaired? Thank you for reporting this. A crew will be out to investigate. In the future if it is something that is a safety concern please call (918) 259-8373 as it would need immediate attention. There are numerous potholes between 41st and 40th st on 209th st north bound lane. The road is asphalt. Exposed utility lines. Unfinished project. These utility lines have been like this for approximately a year or longer. Unsightly!! !